the consequential freeing up of the central lawn in the private area. 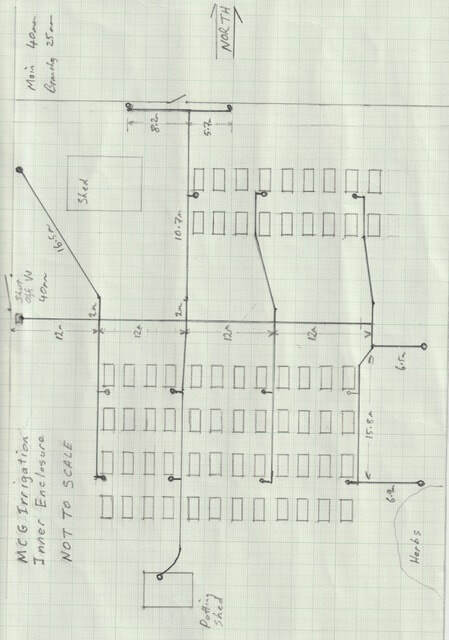 Don's sketch diagram (not to scale) below. Many thanks for getting involved in the fruit fly baiting. There are quite a few recipes when you search online. Most involve something yeasty and something sweet, and even fruity. The one below adds banana peel. Fruit juice is also suggested by others. I think a gd idea to add a tiny squirt of detergent - helps the fruit fly to sink instead of swimming. The vegemite takes a while to dissolve properly, so best to do the hot water mix in your jug a day or two in advance, and keep stirring, before diluting with cold water later. The bottles should have a lid on the top to keep the rain out, but 1/2“ holes cut half way up two sides. The more bottles we hang up the better. Add one heaped teaspoon of vegemite to one litre mixing jug. Add half a cup of hot water to dissolve the vegemite. Add 1/4 cup of brown sugar. Add finely chopped banana peel. Fill remainder of jug with cold water. Cut two small holes at top of empty 1.25 litre plastic bottles. Have a good Xmas break Marie. One of our avid gardeners, Barbara, has provided interesting information about purslane, a plant that is popping up everywhere in our plots. There are MILLIONS of purslane weeds growing in all the gardens. There is always something isn’t there? Jenny has some in her plot and we had a munch on them. She said that at the last Farmers Market she went to, they were selling it in snap-lock bags. IMPORTANT: a similar plant named "hairy-stemmed spurge" is poisonous. Click here for more information. Purslane is a succulent annual trailing plant that grows in many countries because it thrives in poor soil. It can be eaten as a cooked vegetable and is great to use in salads, soups, stews or any dish you wish to sprinkle it over. Purslane is antibacterial, antiscorbutic, depurative, diuretic and febrifuge. The leaves are a very rich source of omega-3 fatty acids which prevents heart attacks and strengthens the immune system. Distinguishing Features: This nutritious weed has a distinctive thick, reddish stem and succulent, green leaves. Flowers: Purslane has yellow flowers that occur singly or in small terminal clusters. When fully open, each flower is about .5 cm(¼") across, consisting of five petals, two green sepals, numerous yellow stamens, and several pistils that appear together in the centre of the flower. These flowers open up for a few hours during bright sunny mornings. Purslane flowers bloom from mid-summer through the early fall and lasts about 1 to 2 months. Each flower is replaced by a seed capsule that splits open around the middle to release the numerous small, black seeds. Fields of Nutritionhas medicinal benefits and vitamin/mineral content of Purslane.Leaves: Leaves are spoon-like in shape and are succulent (fleshy). Height: Purslane tends to be trailing plant and can grow to 10 cm in height. Habitat: Purslane is often found thriving in the cracks of sidewalks and driveways even during summer's heat. It often pops up in container gardens, flowerbeds, gardens, fields, waste ground and roadside. Edible parts: Leaves, stems and flower buds. Similar plants: Hairy-Stemmed Spurge, which is poisonous. Click here for more information. This wonderful green leafy vegetable is very low in calories (just 16 kcal/100g) and fats; nonetheless, it is rich in dietary fiber, vitamins, and minerals. Fresh leaves contain surprisingly more omega-3 fatty acids (α-linolenic acid) than any other leafy vegetable plant. Mediterranean fruit flies are a major pest for both home gardeners and commercial growers. They lay their eggs under the skin of ripening fruit, maggots hatch and feed, spoiling the fruit, causing it to rot and drop. Host plants include citrus, stone fruits, apples, pears, avocados, bananas, mangoes, tomatoes, eggplants and capsicum. When gardeners fail to control fruit fly the problem can easily spread from their own garden to neighbouring gardens. Many people are deterred from growing tomatoes, citrus and other crops because of the fruit fly problem. This event will help you prevent the problem. OCP’s Eco-Naturalite is a registered organic fruit fly control bait spray for both male and female flies. It combines specific food-based attractants, which target only fruit flies, and a bacteria-derived insecticide called spinosad. Application is easy: it's a spot spray, not whole-tree application. There is no withholding period. OCP also sell fruit fly traps. The talk will be at 12.00pm on Saturday 30 November at Cupitt’s Winery, 58 Washburton Road, Ulladulla. It will follow on from the regular Gardeners’ Exchange and Growers’ Market that is held at the winery for 10am-12.00pm on the last Saturday of each month. If you plan to attend please email Helen Moody on hortimedia@aapt.net.au just so that we can get an estimate of numbers. • Rats have returned to the MCG! Rat baits have been laid and seem to have rid the garden of these pests. Please let the Garden Managers Harley or Jocelyn know if the problem returns. Rodent baiting began July 2014 and has continued into 2015. Rat baiting is now an on-going task at the garden, especially around the worm farm, compost and plots where favourite foods are grown! • Raised flexible perimeter fencing, courtesy of Steve, is keeping the Wallabies at bay. • a rotational planting system. New Blueberry orchard established on western section of communal area. New beds dedicated to asparagus, rhubarb, potato and herbs. Raspberry canes planted (first fruit consumed!). Extensive reduction in weed/grass infestation. 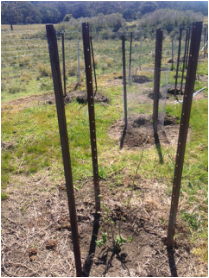 8 Hazelnut trees planted and growing well. An additional citrus grove is planned for the north east. Postscript: six orange trees planted and flourishing. 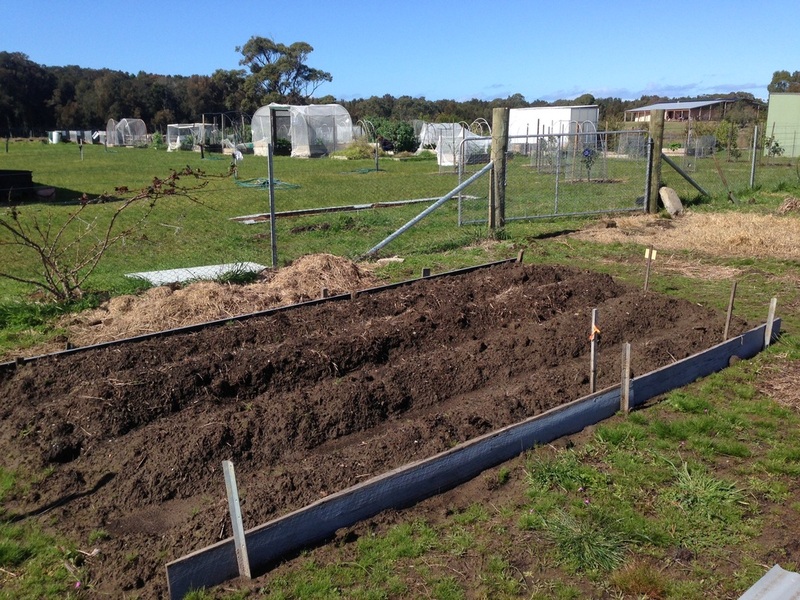 Communal potato bed, with beetroot bed to the left. 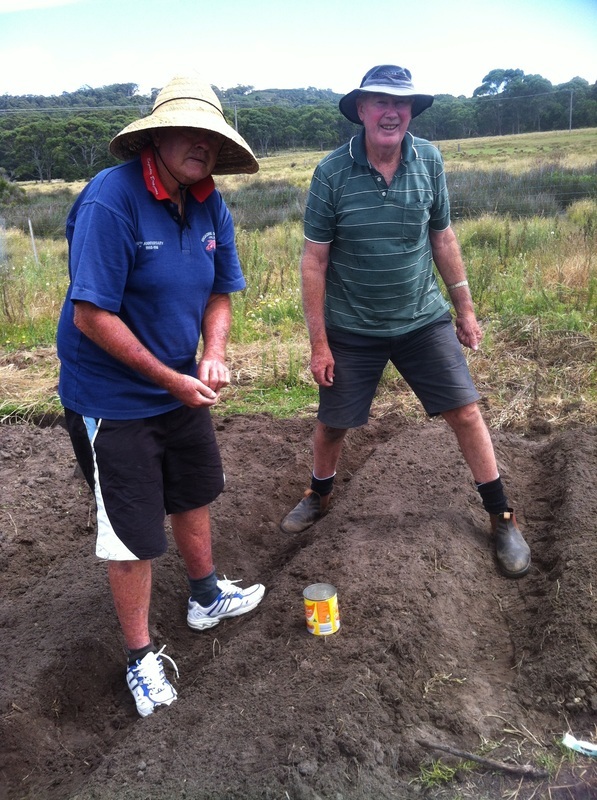 Bob and Harley preparing furrowed beds for garlic crop. Furrows run down the slope towards the creek. 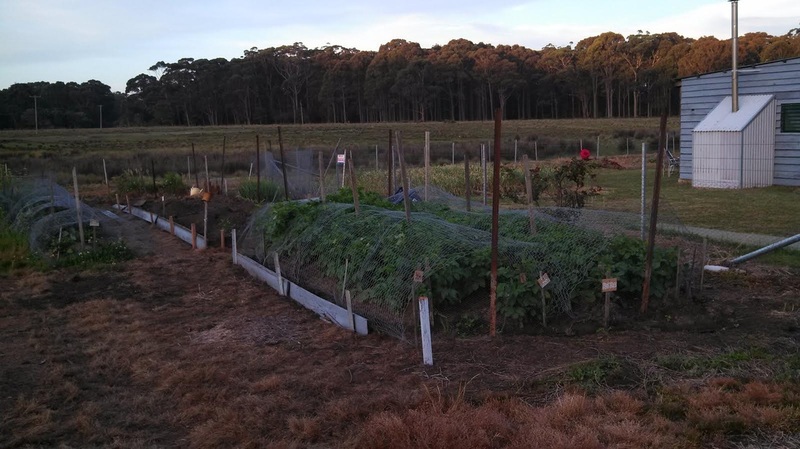 12 November 2014 - Herbs have been moved to temporary location and a new member has taken over their raised bed. Suggestions for the relocation of the communal herbs include an oregano patch behind the eastern notice board in front of the 1st compost bin. The oregano would help in improving the look of the MCG entry and its spread could be controlled by mowing. A location for rampant mint has yet to be decided. Ewen, Neil, Roger 'helping' Mary clear a derelict plot. The MCG Management Committee reminds members to maintain their beds regularly. 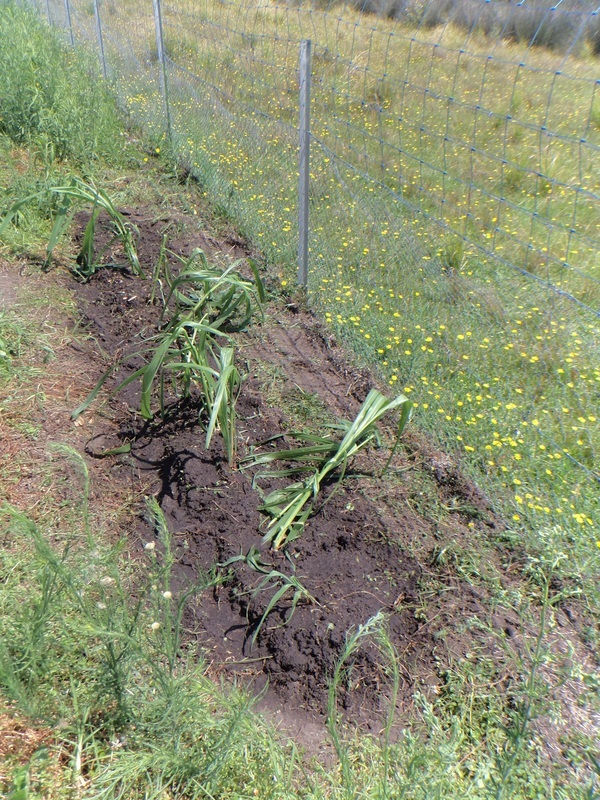 While it is understandable that crops can go to seed quickly and weeds, especially at this time of year can take the upper hand, if left unchecked weeds from derelict plots will invade neighbouring and communal beds, make mowing and peripheral spraying difficult, and can look unattractive. If they plan to be away for extended periods plot owners can ask friends to maintain their beds, or give Garden Managers permission to weed and spray until they return. Currently the seed raising house remains unused by many, although some people have raised seedlings for planting out - members are encouraged to use this great facility! It now has its own tap and hose outlet! However, recent scientific reports have highlighted the dangers associated with glyphosate and while the MCG continues to employ its use in weeding difficult to manage perimeter areas of the site it is turning to alternatives such as brush cutting and the use of a mulching mower for the control of weeds. Click here for great review of the use of glyphosate prepared by MCG member Elizabeth Begg. Weed Control - Mowing etc. MCG Management Committee has resolved to glypho around all beds and perimeter fencing to control infestation of kikuyu grass in both the individual and communal areas of the MCG. It was agreed that the use of brush cutters to control the kikuyu is beyond the resources of the MCG given the extent of the problem, especially in summer. The first spraying, conducted in early September 2014, has proven successful. The grass has been controlled at a fraction of the cost in time effort in using mechanical means of control. 24 January 2015 WEEDS, WEEDS, WEEDS! !…we have an infestation of ink weed and other invasive species in many plots and in the new(ish) communal areas. Please ensure that your plot is weed free to avoid seeds spreading to other plots, something that is occurring with annoying frequency of late. A half hour spent hand weeding in the communal area by each of our 70 + members, especially on the northern side of the garden, would eradicate these weeds in no time at all…otherwise it's such a huge job for a few people so your efforts would make a big difference. 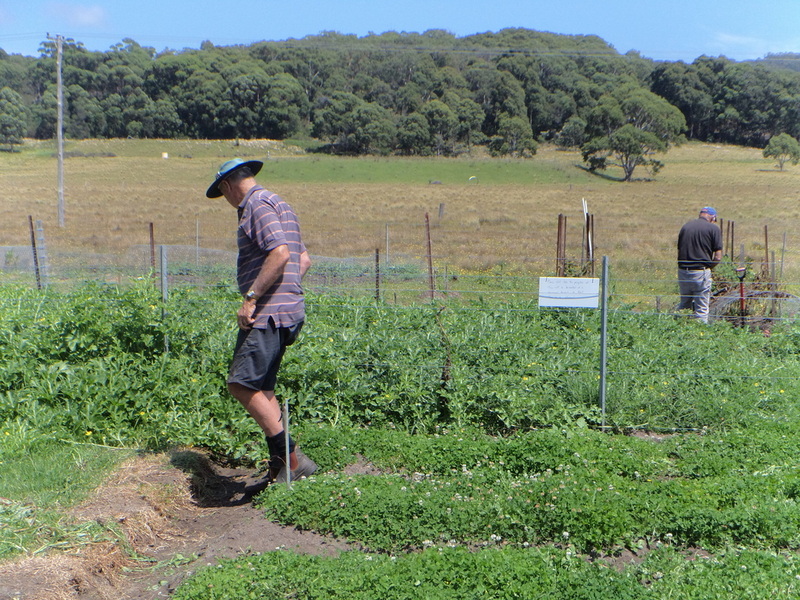 24 January - Harley has been spraying tall weeds only in a bid to preserve the clover ground cover. Clover, a summer species, fixes nitrogen into the soil, a great benefit to the communal beds. 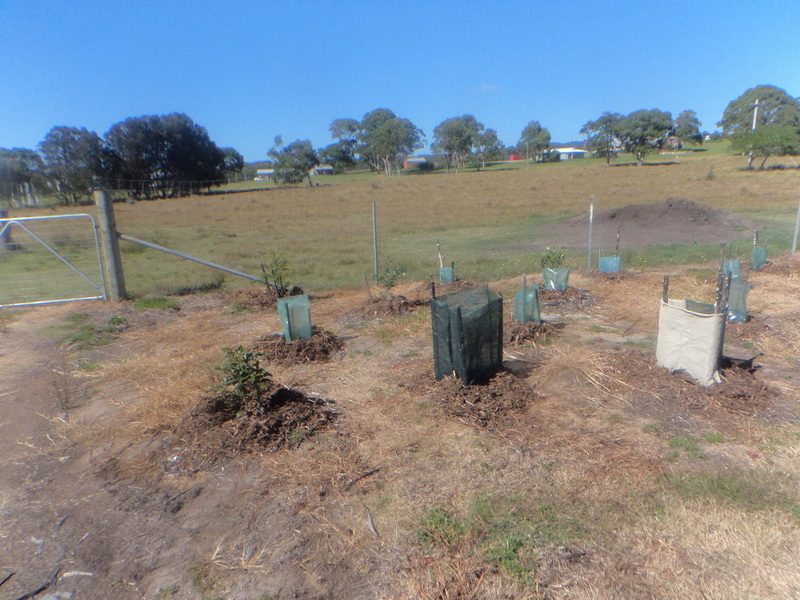 February/March 2015 - "feral" weeds have been sprayed and several plots had weeds removed by a working bee of members because the VERY large weeds growing in these plots were seeding and spreading to adjoining plots. Supervised by the garden managers, great care is taken to ensure that spray drift is contained to the areas needing control. As it would seem wasteful to not reuse the goodness that is in all of the plants we grow - particularly the stems and leaves - the MCG has a system of composting bays to collect discarded crops. The process is a valuable recycling unit providing future garden beds with valuable nutrients and by understanding and respecting the process, members may all value the benefits they give. 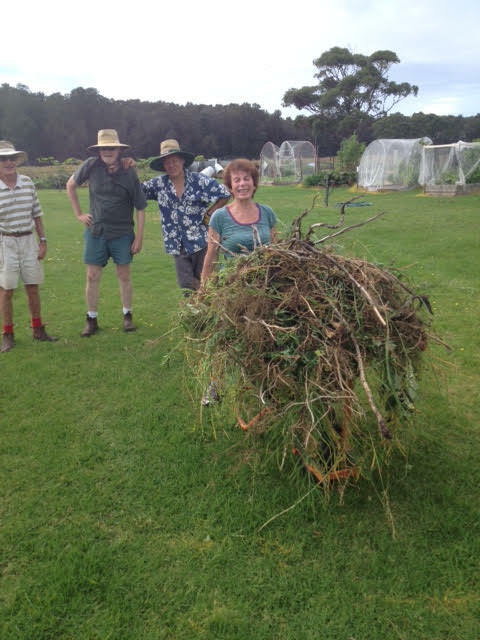 Most of us at the MCG pamper our beds with all kinds of love to encourage prolific and healthy veggies - seaweed, worm castings, straw mulch, dynamic lifter, to name a few additives - and benefit from the nutrition our organically grown veggies give us. As the philosophy of the MCG is to grow food together, we can share the bounty by reusing what we have got and sharing what we don’t need. We don’t want let all those goodies go to waste so we turn the spent plants into a lovely rich compost mix to top up beds after heavy cropping. 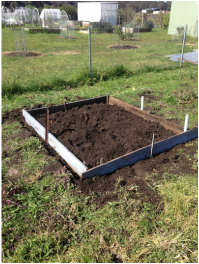 Compost forms with the breakdown of plant material by soil bacteria and worms. There is a complex and very valuable living ecosystem working in the bins which needs air and water, and a variety of material - green and brown. Compost material will be more efficiently broken down if it is not suffocated by large sized pieces of vegetation, like cabbage or rhubarb leaves, or woody stems that are thicker than a thumb. We ask that plants be chopped into lengths no greater than a hand span, and have left an old, but incredibly efficient, spade next to the bins for this purpose. Please just pile your waste on the grass next to the bin AND chop, chop, chop then add to the current composting bay. The location of this bay will change from time to time as material is left to be converted back into soil nutrients. It will eventually be ready to distribute on the beds again, so please check the signs. The composting bays are not rubbish bins, and there are some definite NO/NO’s. Contaminating waste often turns up in garden beds. So what goes in and what doesn’t? Public enemy No 1 is Kykuyu grass closely followed by Wandering Jew and Pennywort plants (among other creeping invaders ) which fall into the same group. You may see them sneaking in underneath the boards of your beds, or spreading through the soil. ANY slip of root will regrow with gusto and invade the garden beds. Plants and roots should be taken home in a plastic bag for disposal, left somewhere in the sun to dry completely, or tossed over the fence. Crops that have been allowed to go to seed can spoil the compost material too. By being diligent in tending to your crops, you can spot when your produce is “going to seed” and if you choose not to harvest seeds for your own use, then it is the time donate the plants to the composting process BEFORE they set seed. Seeds can be collected by you for further use but please don’t dump seed heads into the bays. They will create a lot of weeding work for you and our volunteer workers in the future. Watch out also for any weeds bearing seeds, particularly grasses. They will also invariably invest the compost material. Tomato plants carry a disease called “wilt” which can also infect other vegetable varieties. Last year’s disasterous crop is quarantined in a separate “TOMATOES ONLY” ( labelled ) bay. By the way, many of the little tomato seeds that previously found their way out of beds and into the compost, are just showing their heads in the most extraordinary places. Please, if you see a tomato seedling in an inappropriate place, just pluck it out straight away. ﻿Sybille's presentation notes on worm farming. Clover stretching to the right of Harley's boot. January 2015 - Harley is planning to use dynamic lifter in preparation of the garlic bed for planting of the crop in March this year. He has already planted the rows of the bed, running north-south along the drainage line, with clover, a summer crop excellent for replenishing nitrogen in the soil. See clover in foreground of picture to the left. 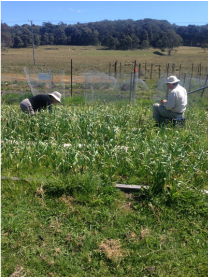 24 January 2015 - Trench watering, and the employment of raised beds running north/south along the slope to the northern creek has improved the drainage of communal plots such as the garlic bed, avoiding troublesome pooling and swamping during the recent summer rains. Don't forget to turn off the water when you are the last to leave! 8 November 2014 - Two new windbreaks have been paced out and the ground weeds have been sprayed by Harley. One is located to the far west, and the other to its south. Windbreaks will extend from the dead tree stump ot the side gate and along the western fence as far as the hazelnut plantation. Jocelyn has chosen suitable species including callistemon, cheese trees, etc., and as many bush tucker plants as possible. (images to follow). 24 January 2015 - Sybille has planted a new - Bana Grass. 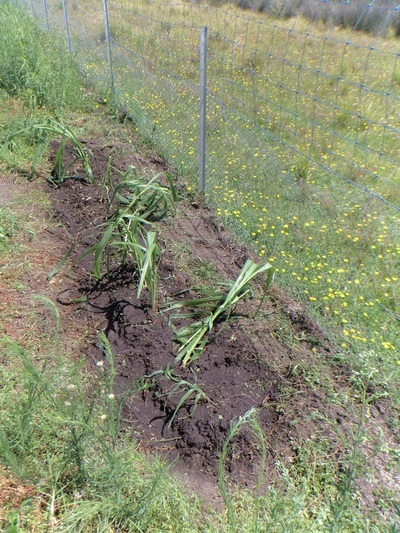 The grass has been grown successfully for use as a windbreak and as compost. Apparently not invasive the grass has been planted near the worm farm and in a small plot on the northern boundary.